To start off my series on iconic board game designers and their available catalog, I’d like to introduce to you, French game designer, Antoine Bauza. But first, let me explain why I am going to discuss designers. Similar to books and quite unlike the games most of us grew up on; modern board games include the name of the designer[s] on the boxtop. The reason for this is to partly provide credit but also I think it links a name to a product which can, in time, can lead to certain designers becoming known for certain types of games. By knowing the designers and their catalog, you (as a librarian) can help develop collections to meet the need of your community. Many designers are prolific, some are very diverse in their creations but most have some signature which sets their games apart from other games on that market. Let’s explore that with one of my favorites game creators, Antoine Bauza. Mr. Bauza has had an amazing career in an rather short time. He has designed everything from Kennerspiel des Jahres winner 7 Wonders and the wonderfully whimsical panda trip Takenoko. to the brutally hard cooperative game Ghost Stories and the perennial favorite cooperative card game, Hanabi. If you scan the list below, you may notice that Mr. Bauza has a special attraction to Japanese culture and history with many of his games featuring a Japanese setting or flavor. His signature is an ability to subtly intertwine interesting mechanics with a bright, colorful Far East palette to create delightfully well-paced gateway games. These games are approachable, cute, innocuous and fun (Ghost Stories, notwithstanding). Mr. Bauza, like his contempory French game designers (Bruno Faidutti is another designer who captures the ideal French game design quite well) place a huge emphasis on the development of solidly balanced mechanics and themes providing for a more satisfying narrative experience. Compare this to the dry bottom-up approach of many German-styled designers where game mechanisms take center stage with lightly tacked on themes and little immersion. This also differs from the top down approach of many American-styled designers with mechanisms piled upon mechanisms are piled on top of each other to produce an immersive (albeit sometimes complicated) experience for the player. Bauza creations provide that easy balanced experience along with, occasionally, the use of dice or card draws to produce a nice heap of luck and randomness into his designs. The themes are colorful and vibrant with attractive artwork while still ubiquitous and relatively approachable to most new gamers (pandas, vacations, fireworks, ghosts, etc.). The pacing of the games are appropriate to new and emerging gamers as well with limited mechanisms and short rules which can be taught quickly, and generally take up a relatively small footprint on the table. The level of luck in his games allow experienced players a good time and new players a chance to win on their first go (Takenoko is especially good at this). Also the limited player interaction means less of a need to directly affect another player’s actions with your own leading to a kinder and nicer play experience. 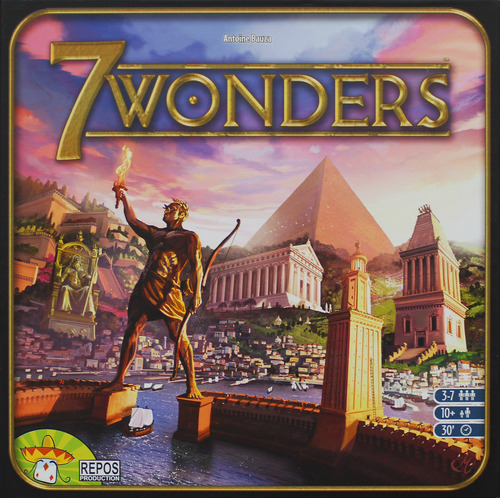 7 Wonders (2010) – In this Kennerspiel des Jahres Winner, Bauza sets players up as leaders of one of the great metropolitan centers of the Ancient World. Through the drafting of cards, (in a card drafting game, the player receive cards, choose one card and then pass the remainder to an adjacent player). Each card allows for the players to gather resources and build structures related to civilian, military, commercial, and scientific entities. The strength of your civilization is based upon several criteria tallied up at the end of the game. While fast to play to learn and play for many experienced gamers, and also well lauded with awards, I’ve had limited success with 7 Wonders with new gamers. As such I recommend easier card drafting games such as Sushi Go! to start with. 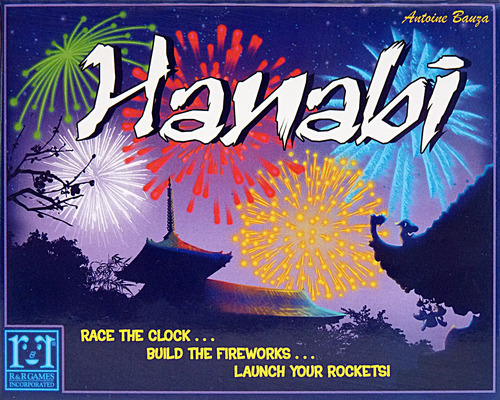 Hanabi (2010) – In this Spiel des Jahres winner, named for the Japanese word for “fireworks” players work cooperatively to create the perfect fireworks show. However, players can’t look at their own cards and must rely on hints from others to know which cards to play. Cards consist of five colors. For each color, players try to place a row the ascending order from 1–5 without making too many mistakes. If players place a card out of order then the fuse gets shorter and the display may go off early. Now, this is the perfect cooperative game to pick up if your library is short on space and money for a game collection. The rules are simple, the box is small, the game play is abstract, and the “alpha player” problem is somewhat mitigated. This is a must have for any library board game collection. 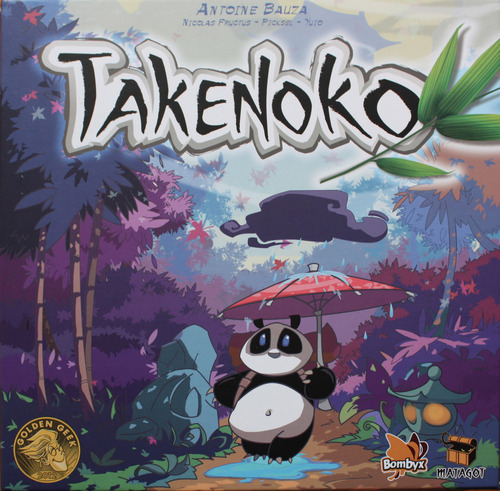 Takenoko (2011): Two words – GIANT PANDA! In this game, the Chinese Emperor gifted a giant panda to the Japanese Emperor. Unfortunately for the players, they are responsible for the care and feeding of the great beast. Running loose in the bamboo garden, players can have the panda eat, send the royal gardener to tend the bamboo, expand the garden, and a host of other actions in order to meet personal objectives and score points at the end of the game. With a little added luck, players also roll for the most unpredictable thing imaginable – the weather. Perhaps the cutest of all the gateway games Takenoko has minimal player interaction and serves as a friendly introduction to gaming. 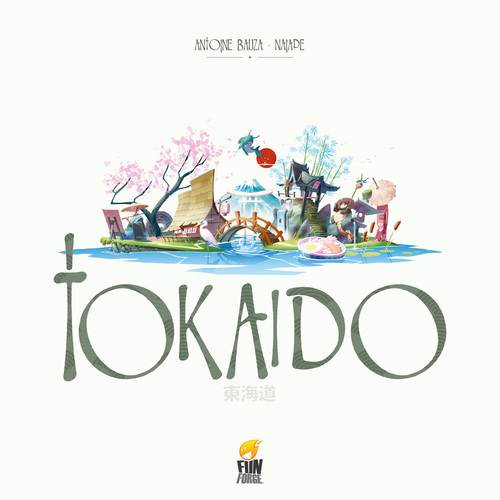 Tokaido (2012): In Tokaido, each player is traveling across the famous East Sea Road during their vacation. As with most vacations, you want to meet interesting people, eat good food, buy souvenirs and generally see all the sites. Players do this by advance en masse along several spaces on the board taking actions and collecting cards to score points. Your main decision is how fast or slow you want to move ahead. Go slowly and you get more chances to go. Move quickly and you snag up highly desired spots but then may go less often and miss out on other attractions. It is a very relaxed game with minimal tenseness but just like any vacation, you tend to nudge and poke the people around you in order to get the best view, tastiest food, etc. 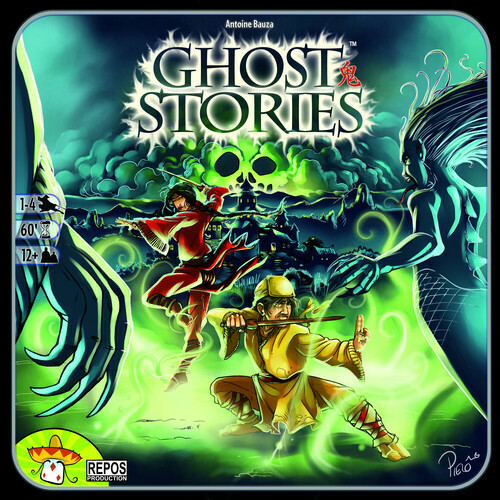 Ghost Stories (2008): In this cooperative game, players are Taoist monks protecting a small Chinese village from waves of ghosts, hauntings, and an incarnation of the lord of hell, him[her]self, Wu-Feng. Players can exorcise one of many ghosts attacking the village [using special powers, talismans, dice rolls) or can elicit help from a villager tile. This game starts off smooth and easy and you think “Hey, this isn’t so bad…” and then BAM! Ghosts are coming from everywhere, the village tiles are haunted and rendered useless, your monks are flailing about and losing their dice roles and WU-Feng is coming! This is not your entry level cooperative game and you will lose more often than not but if your group is tired of playing Pandemic and wants to try something even more unforgiving, then Ghost Stories is for you. However, if your library is just starting a board game collection or board game events, then this one is best held off on until later when your group has a few plays of easier games under their collective belts. Does your library have these in their collection? My library branch has Takenoko, Hanabi, and 7 Wonders in it’s board game collection and I would easily recommend them all. I was torn between Takenoko and Tokaido and decided on Takenoko solely on the presence of an adorable panda. My personal collection has every game listed above as I am unabashedly Team Bauza! I thinks his games add an element of whimsy and personality to, at times, a rather dry catalog of gateway games. Without a doubt, you should have Hanabi in your collection as a quick card game and a nice introduction to cooperative play. However while Hanabi and 7 Wonders will have some staying power in your collection, the others will likely get left behind as players discover newer, deeper games.